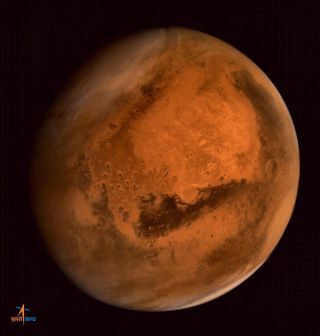 This image of Mars was captured by India's Mangalyaan spacecraft, which arrived in orbit around the Red Planet in September 2014. If dad already has enough ties and coffee mugs, you could always name a Mars crater for him this Father's Day. The space-funding company Uwingu, which sells naming rights to the 580,000 cataloged Mars craters that have yet to receive a moniker, is offering a special deal: Name a crater between now and Father's Day (June 21) and receive a decorative certificate, either a downloadable digital version or a printed and framed one. "This is an out-of-this-world way to honor dads across this planet," Uwingu CEO Alan Stern, who also serves as the principal investigator for NASA's New Horizons mission to Pluto, said in a statement. "Help your dad join our 'Dads on Mars' club!" The chief goals of Uwingu (whose name means "sky" in Swahili) are spurring public interest in space science and exploration, and helping fund research and education projects in the field. Half of the company's revenues go toward this latter purpose, Uwingu representatives said. Crater names purchased via Uwingu won't be "official" monikers recognized by the International Astronomical Union. However, the names will find their way onto Uwingu's "People's Map of Mars," which will fly aboard the Mars One colonization effort's first robotic Red Planet lander. That spacecraft is currently scheduled to blast off in 2020. "I'm excited to name a crater on the Uwingu Mars map in honor of my own dad," Uwingu's Ellen Butler said in the same statement. "It'll be fun to share this with him on Father's Day. I know he'll love telling his friends that I named a crater for him!" Follow Mike Wall on Twitter @michaeldwallGoogle+. Follow us @Spacedotcom, Facebook or Google+. Originally published on Space.com.